1. Preheat the barbecue or light and leave until the flames have died down and the coals have turned grey. For the chimichurri sauce, place all the ingredients in a food processor and pulse a few times until you have a finely chopped yet coarse mixture – be careful not to over process. Set aside, seasoning with a little salt and a good grinding of black pepper. 2. To prepare the chicken, place on a chopping board and, with a sawing motion, slice through each fillet horizontally, making sure not to cut all the way through, then open out. 3. In a bowl, combine the garlic, sweet paprika and lemon zest with the olive oil and rub all over the chicken pieces. 4. Place the chicken in the centre of the barbecue and grill for 3-4 minutes on each side until cooked through with no pink meat. 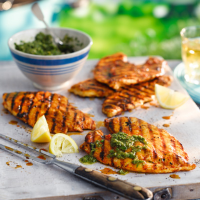 Serve with the chimichurri sauce.